Many people feel that their financial future has never been more uncertain. Conversations about “when” to retire have been replaced with “if retirement is possible.” The stock market hasn’t inspired very much faith because of its tremendous volatility and CD’s pay rates of return that are so low they barely merit consideration. This has left people wondering what can be done to protect their wealth and create a comfortable retirement. library of the Creating Wealth show in book form and on CD, a full-year subscription to the Financial Freedom Report newsletter, and an area tour with Jason where you can see the process he goes through in selecting properties firsthand. With $4,473 in free bonuses, Jason’s inner circle is a tremendous value at $4,997. 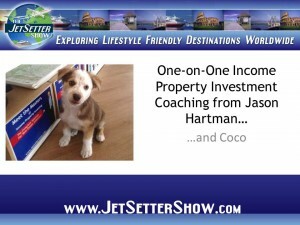 Whether you’re looking for relief from onerous mortgage terms or simply want to learn how to invest in history’s best asset – real estate – browse Jason’s entire selection of educational products, please visit JasonHartman.com.